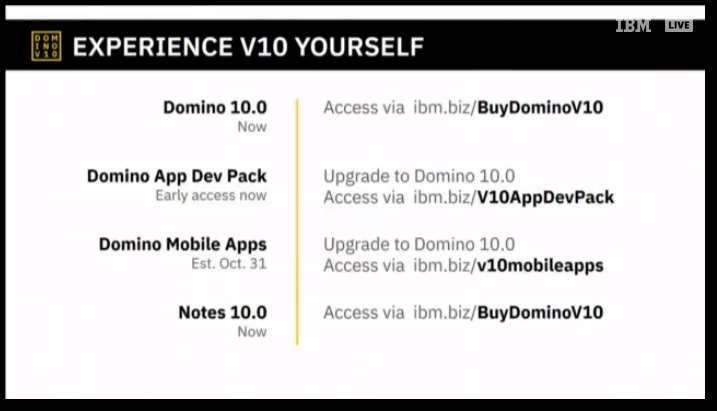 Today IBM during a nice launch event has announced IBM Domino V10 and Notes V10 that will be available for download during next hours! The replay of the event is available here. IBM has also launched a huge marking campain for licenses so if you need to renew your license or you need to buy some more , please visit the following link and you will not be disapponted ! 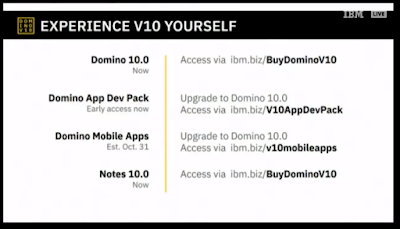 Today was announce also IBM Domino Mobile Apps (Notes on iPad ) that should be available at the end of October and Domino App Dev pack ( NodeJS inhtegration ) that should be available in early access beta very soon.